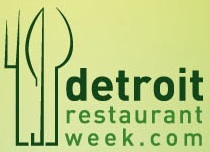 Last week, Restaurant Week descended upon Detroit again. For this round of DRW there were 18 restaurants charging $28 for three courses. This time around, Erin and I visited three different restaurants. Happily we didn’t have any serious misses this time around unlike last year. Service was either good or fantastic in general. The food was equally good. The first restaurant we visited was Iridescence. As I’ve pointed out in the past, Iridescence is our favorite restaurant (at least in Michigan). The previous two times we were there we had an amazing experience. Happily, Iridescence continued to meet and surpass our expectations. We arrived early so we grabbed a drink at the little bar outside of the actual restaurant. It’s nice that the bar area is actually outside the doors of the restaurant as it keeps the more relaxed and slightly casual area separate from the formal elegance of the restaurant proper. Before we had a chance to finish our drink we were brought into the restaurant and seated at our table by the window. We’d been hoping for a window seat the last time but didn’t get one so we were very happy to sit closer to the incredible views of Detroit. We didn’t see our waiter at first though. If one of the managers hadn’t come by to get drinks for us and the busser hadn’t been so attentive, our waiter’s lack of presence throughout the meal would have been the first black mark against Iridescence. The busser came by regularly though and made sure we were ok. When our waiter did come by he was quick but courteous. For the first course, we both had the Crab Po’boy. At first we were concerned that the crab cakes weren’t an option for the first course again like the previous two DRWs. The crab po’boys were actually quite amazing though. For the entrees, Erin has the Mushroom Risotto and I enjoyed the Braised Lamb Osso Bucco. The Risotto was good, but not nearly as good as my Osso Bucco. The lamb was falling off the bones and was as tender as any lamb I’ve ever had. For dessert we both had Dark Chocolate Mousse which included a chocolate crumble, cappuccino cheesecake, and ice cream. It was all delicious. During dinner Erin ordered a glass of wine and I ordered a glass of Woodford Reserve on the rocks. Erin’s glass was more full than you’d usually suspect, however, my glass was nearly a third of a fifth it was so full. It was another excellent experience at Iridescence. The only things that could have improved it would be if they were still doing the Amuse Bouche and if our waiter had been more attentive (though thankfully other staff members picked up his slack). Also, I have to salute them on changing from the flat bread they had in the bread basket in years past to a biscuit and soft pretzel instead. Both choices were amazing. Next, Erin and I visited Opus One. Opus One has been open since 1987 and they seemed very comfortable with what they were doing. The service was good, though not amazing. The food was equally good. For the first course, we both enjoyed the Lobster Bisque. It was tasty and the ravioli hidden inside of it was a nice touch. For the entrée, Erin had the Crab and Lobster Stuffed Fillet of Norwegian Salmon and I had the Pan-Seared “Wild-Caught” Sea Scallops. Thankfully the waiter warned me of the size of my scallop dish when I ordered it. It consisted of about 5 (smaller) scallops with no accompaniment. While the scallops were delicious, it seems quite odd to have no accompaniment with an entrée, especially when the dish is so small. Erin’s stuffed salmon was of a decent size and very good. It did have a hint of fishiness to it, but not as bad as some salmon I’ve had during DRW. For dessert we both enjoyed the Hot Fudge Cookie Sundae. I would say it was one of the better DRW desserts I’ve had over the years. All in all, it was a good experience, and I’d go back again, but I would certainly try something new first. Additionally, charging valet seems unnecessary. There isn’t a lot of safe public parking right outside of the building which means you’re either walking a few blocks through Detroit or have to valet it. People are already paying a lot for their meal, is it really necessary to charge for valet (when the valet lot is directly across the street)? Lastly, we went to Roast. Roast is located inside of the Westin Book Cadillac and shares valet service with them. If you’re staying at the Book Cadillac or eating at Roast, it’s not cheap, and $7 seems a bit much to charge for valet (can you see a trend of me not liking having to pay for parking?). We actually arrived about half an hour early but they had an opening and sat us right away. Roast has a fantastic beer and wine selection so we started the evening with some decent beverages. For the first course, Erin had the soup which was a Potato Leak soup. While different than the soup she had at Roast last DRW (which was more of a mushroom soup), the Potato Leak soup was amazing. I enjoyed the Veal Sweetbreads (lymph nodes!). They were amazingly tender and delicious. I was disappointed that they didn’t have the Hot Stuffed Peppers again for a first course but the sweetbreads were very good. For the entrée, Erin had the Gnocchi and I had the Roast Beast of the Day (Suckling Pig). Her Gnocchi was amazing and my beast was very tender. For some reason when I think “Roast Beast” I consistently think of cow though I’m clearly mistaken as the both this time and last, Roast’s Beast of the Day was pork. For dessert we both had the Lemon Bar (the only selection). It was light but a bit too lemony for my taste. Roast continues to be a place that is very delicious and we wouldn’t mind going there not during DRW though I’m not sure when or if we will. If you’re looking for a good restaurant in Detroit, as I’ve told anyone that has asked (and some people that haven’t), I cannot more highly recommend a restaurant than Iridescence. My parents went to Iridescence the weekend after us and they let us know afterwards that it was their new favorite restaurant as well. I’m such a fan of Detroit Restaurant Week that I made an Android application to help view restaurant menus, make reservations and read reviews. I had quite a few people download and use it and have some really great ideas for what I’m going to do for the next DRW in September.